Any suggestions on how to tag an abandoned cemetery? (There are almost no visible traces of the graves, i.e. no stones, crosses etc. But it is known that it used to be a cemetery and the area is self-contained and not open to the public). (And also, I would like to see it somehow rendered nicely ;-). Thank you for the two answers. I decided to use the following combination: abandoned:landuse=cemetery+ historic=cemetery + natural=wood + a name that indicates that it is a former cementery (EN:Former .. / DE:Ehemaliger ...). Unless a historic cemetery acquires a different sort of land use, I think it is difficult to say whether or not it has been abandoned. I would be reluctant to use an abandoned:landuse=cemetery tag without understanding the formal legal status of the land concerned. Practices concerning cemeteries vary. Records may be lost, or not kept. Grave markers may have deteriorated so that they were no longer readable or, if they were wooden, rotted away. I know of several closed cemeteries where all the head stones and grave surrounds were removed and the area left as grass, except for a single memorial that named those buried there. I also know of a cemetery where a part became overgrown because old records were lost and the area was not maintained. When a genealogist asked questions about where some early settlers were buried, an archaeological dig discovered where these early graves were, much to the surprise of the responsible authorities. 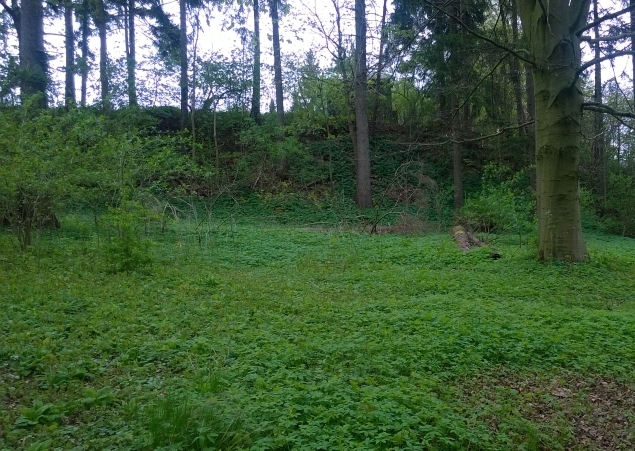 At the time the area has reverted to wilderness but it is still used as a cemetery, as the land was later cleared and the historic graves marked. To really be abandoned, the graves should be dis-interred, or the land should have a different use. Ok, I am now favouring the "once a cemetery always a cemetery" approach. Nachtspazz, since there still could or would be graves in the cemetery it still remains what it is. You’re conclusion it is not used anymore is not a reason to cancel the former use. A Jewish cemetery will remain just that even if there is not actual used for burials anymore. You could however add or use historic=cemetery as extra. Thanks. I understand what you say, but it is really not visible that it used to be a cemetery. I will attach a picture to my question. So the name of the place and the historic knowledge still reflect that it was a cemetery, but not much more. I really agree with @hendrikklass here. Once a cemetery always a cemetery. Many of the London 'Magnificant Seven' have not had burials for decades, but they are still cemeteries. At least in the UK specific permission is required to allow reuse of a cemetery (and this will involve formal re-interment of any human remains). Also, as mentioned, Jewish cemeteries provide a particular issue as the communities which maintained them may have been destroyed. Additionally some large victorian era cemeteries may not permit new burials, but are used for cremations and burial of ashes in family graves. So if you know a place has been used as a cemetery and also do not know that specific permission has been granted for use for other purposes then use landuse=cemetery. Other tags can be used (such as natural=*) but additional polygons may be needed, see for instance Abney Park which is a cemetery, a local nature reserve and a park. This does suggest that whether burials are permitted may be something worth tagging for cemeteries & grave yards. Clearly there is also a limit in the sense that archaeological sites which contain graves are not tagged as cemeteries. So the likely legal status is probably the most useful indicator. Hi guys, and what about the new option of being buried in a forestry area ? In a so called nature grave_yard ? In my hometown (Germany) there are several older cemeteries which act as parks today. There are still several visible tombstones, however no special permission is required to access them. I wouldn't call these places cemetery because they aren't used as such any longer. Quite likely that there has been a transfer of remains at some point in time. However this somewhat disqualifies the "once a cemetery always a cemetery" concept. @scai my town also (see http://www.openstreetmap.org/way/30596483 or http://www.openstreetmap.org/way/115554270). Usually, this is relatively easy to determine, but sometimes they become both parks & cemeteries (Abney Park & Tower Hamlets Cemetery Park in London are both good examples). Quite clearly abandoned:landuse=cemetery for me (and now likely landuse=forest). In fact your question is rather a discussion of what lifecycle concept to use than just this specific case. I like the fact that a lifecycle key prefix automagically makes this former cemetery not render on most maps and not show up in object simple searches for landuse=cemetery. As we can see on the image and as you nicely describe in your comment it is "really not visible" and "not much more" than historic knowledge is left over (just people with this historic knowledge or knowledge how abandoned cemeteries may look like may recognize specific landscape structures which stem from the former use). You ask in your question "see it somehow rendered nicely": well, everybody is free to add a styling for such abandoned cemeteries. E.g. history maps. I tend to agree. However, I am still struggling a bit with current status of the area. It is definetly not landuse=forest, because there is no forestry. And it is a self-contained area to which access is gated by a locked gate. Unfortunately, the area is not surrounded by a wall or a fence. (Access is naturally limited to the place where the gate is located). Otherwise the name plus the delimitation by wall/fence could be enough to designate the place on a map. And due to the historic knowledge about the place, I would like to see its name on a map. Maybe place=locality might be an option (in combination with abandoned:landuse=cemetery and a name that indicates that it is a former cementery). Or maybe just natural=wood and a name that indicates that it is a former cementery (plus abandoned:landuse=cemetery). @Nachtspazz: no forestry? Hmm, will old or even fallen trees not be removed? Okay.